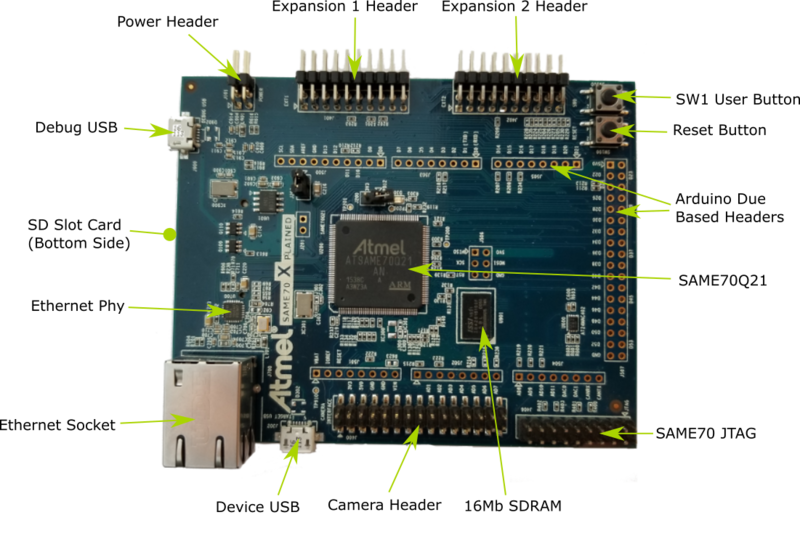 The SAM E70 Xplained evaluation kit is a development platform to evaluate the Atmel SAM E70 series microcontrollers. The default configuration can be found in the Kconfig boards/arm/sam_e70_xplained/sam_e70_xplained_defconfig. The SAME70-XPLD User Guide has detailed information about board connections. The SAM E70 MCU is configured to use the 12 MHz external oscillator on the board with the on-chip PLL to generate a 300 MHz system clock. The ATSAME70Q21 MCU has five UARTs and three USARTs. One of the USARTs is configured for the console and is available as a Virtual COM Port via EDBG USB chip. Flashing the Zephyr project onto SAM E70 MCU requires the OpenOCD tool. Support for Atmel SAM E microcontroller series was added in OpenOCD release 0.10.0, which was added in Zephyr SDK 0.9.2. By default a factory new SAM E70 chip will boot SAM-BA boot loader located in the ROM, not the flashed image. This is determined by the value of GPNVM1 (General-Purpose NVM bit 1). The flash procedure will ensure that GPNVM1 is set to 1 changing the default behavior to boot from Flash. With the board power off, set a jumper on the J200 header. Connect the SAM E70 Xplained board to your host computer using the USB debug port. Then build and flash the Hello World application. You can flash the image using an external debug adapter such as J-Link or ULINK, connected to the 20-pin JTAG header. Supply the name of the debug adapter (e.g., jlink) via an OPENOCD_INTERFACE environment variable. OpenOCD will look for the appropriate interface configuration in an interface/$(OPENOCD_INTERFACE).cfg file on its internal search path.